The Maltese is a joy to own, but his long luxurious fur requires high maintenance care to prevent painful tangling and matting. As your dog becomes accustomed to the brushing experience, it becomes a time of relaxation and you might catch your Maltese snoozing before you're finished. Brush the rear, feet and tummy first. No Maltese enjoys having these areas brushed, so get them out of the way so the remaining brushing experience is enjoyable. Spray leave-in conditioner that's for dogs on the buttocks and use an open-spaced pin brush to brush the fur. To remove tangles, hold the base of the hair firmly at your Maltese’s skin and use your pin brush to pick through the tangle. Start at the hair's ends and work towards the skin until the buttocks are smooth and free of tangles. Follow these same steps for the tummy and feet. Brush the tail. Start at the base of the tail, which is where the tail meets the body. Spray a leave-in conditioner and comb any tangles that have accumulated at the base. Gather the Maltese’s tail fur into your hand and spray it with a leave-in conditioner. Keep a firm grip on the fur and brush using the pin brush at the fur's ends and work toward the Maltese’s skin. Comb the Maltese’s face. Remove eye crust with a cotton ball saturated in water. Use a fine-tooth flea comb to remove remaining eye crust debris without pulling on the fur and avoiding the eye. Point the comb downward and away from your Maltese's eyes and very gently comb the ends of the fur working towards the dog's skin. Use a metal comb to brush your Maltese’s muzzle and head. Brush the entire body. Remove your Maltese's collar. Part the hair into sections and work on each section individually. Lift the top coat and spray the undercoat with a leave-in conditioner. Brush the undercoat with an open-spaced pin brush until the hair is free of tangles. Spray the top coat with a leave-in conditioner and brush through with the pin brush. Follow these steps for each section of hair. Also use these steps to brush the ears, being sure not to spray conditioner inside the ear. Perform a final brushing on the entire Maltese. Spray the leave-in conditioner and smooth over the entire coat with a slicker brush. Give your Maltese a treat for being such a good doggie! 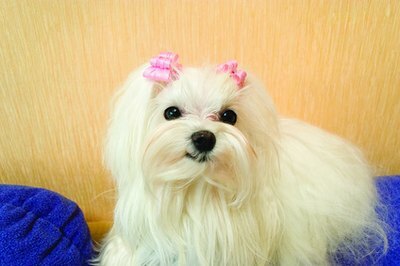 Maltese get matted easily, so brush your dog at least every other day. Consider a low-maintenance puppy cut if you're unable to groom your Maltese at least every other day. Lay down with your dog while brushing him and give him treats throughout the brushing process. The Maltese quickly associates the grooming hour as quality time spend with you. Treats can help increase your Maltese's cooperation. Matting that pulls the skin is painful for your Maltese. It can also break the skin and increase your Maltese's risk for infection. Do not cut the matting since you risk cutting the dog. A professional groomer must shave the Maltese when tangles become this severe. Avoid natural bristle brushes and pin brushes with balls since these break the Maltese's fur, according to Howtogroomamaltese.com. How Often Do You Have to Groom a Maltese's Fur? What Kind of Brush Works Best for a Maltese Dog?